They trip over curbs and walk into glass doors. They lock themselves out of homes. Their cars are covered in dings. They have an orthopedist’s number on speed dial. One of every 29 people is at least 50% more accident-prone than the general population, according to a study published in Accident Analysis & Prevention. But what makes someone susceptible to accidents, mishaps and misadventures? The popular perception is that these people are uncoordinated, unintelligent or unlucky. But researchers have found that these theories don’t hold water. With a few exceptions related to specific physical impairments (see below), people are accident-prone not because it’s their fate or their inherent nature but because their choices and habits lead them astray. That’s good news—choices can be rethought and habits can be unlearned. Placing excessive trust in past experience and learned behavior. Lessons learned over decades or even generations help protect us. We all know not to stand under a tree during a lightning storm, for example. But people prone to mishaps often put too much faith in learned behavior. In truth, there are times when relying on past experience is dangerous. Imagine that your town puts in a new sidewalk at an intersection where you often make right turns. For years, you’ve looked left at this intersection and made your right turn as soon as there’s a break in oncoming traffic. The more strongly you trust the past, the more likely you are to forget to look right for ­pedestrians coming from that new sidewalk. What to do: When you interact with something relatively new, give the activity your full attention. Example: When you buy a new piece of portable technology, stop everything else you’re doing and give the tech your undivided attention before fiddling with it on the go. Relying too much on memory. Is searching for misplaced keys part of your daily routine? Do you chronically leave people waiting because you forgot you were meeting them? If your misadventures often involve forgetting to do things or misplacing things, your problem probably is not that you have a bad memory—it’s that you are asking too much of your memory. Human memory is not designed to recall everything we now expect it to. Our distant ancestors didn’t have to remember to make five separate stops while running errands…or remember passwords for 20 online accounts—so modern brains are not especially good at these things either. What to do: Create systems that take the burden off your memory. Examples: You can link things that you forget to things that you never forget. If you often forget to take a pill in the morning, position the pill bottle next to your toothbrush because it’s something you never forget to use. Or write checklists for activities that tend to lead to mishaps, similar to a pilot’s preflight checklist. Write a ­“going out” checklist to ensure that you gather up your keys and phone, and zip your purse closed so that nothing falls out. Post these checklists where you’ll see them…and get in the habit of reviewing them. If you are interrupted while completing a checklist, take an extra ­moment to review it again. Research on airline crashes has found that checklist interruptions are a common cause of skipped steps and accidents. Attributing past mishaps to the fates. Bad luck plays a role in some misadventures, but the vast majority happen at least in part because of something the sufferer did or didn’t do. 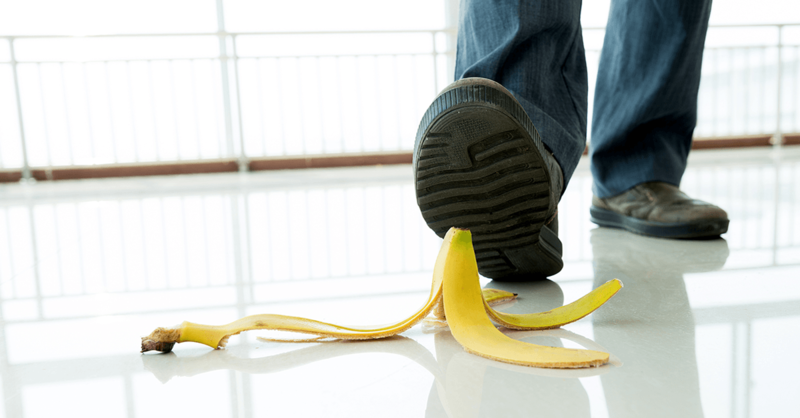 What to do: Consciously take personal responsibility for each of your mishaps or accidents. Analyze what happened and what part you played in making it happen even if someone else was primarily to blame. Why were you in a position to have this happen? What could you do to reduce the odds that it will happen again? Doing difficult things while drowsy. If you do not wake up feeling rested, you are not getting sufficient sleep, and your odds of accidents and other mishaps increase substantially. What to do: The solution here is obvious, though not always easy to achieve—you need to get more sleep. You could do that by taking naps, getting to bed earlier, improving your sleep habits or consulting a doctor about sleep strategies or medications. Also, avoid engaging in dangerous or important activities on days when you wake up feeling drowsy. If you cannot rearrange your schedule, make a checklist of what you need to do that day to increase your chance of remembering everything. Minimize distractions during potentially dangerous activities—don’t use your radio or phone at all while driving, for example. Operating under the influence of extreme emotions. Strong feelings—particularly anger, depression and ­anxiety—can be major distractions that increase the odds of missteps. What to do: Postpone potentially dangerous activities (and other activities during which you have endured misadventures in the past) until your emotions abate. If postponement isn’t possible or the emotions persist, take a few minutes to breathe and calm yourself. At least remind yourself that you are operating with this ­distraction and make a conscious effort to maintain as much focus on the activity as possible. Behaving impatiently. Some people run into problems because they are rushing. They fall off ladders because they reach a little too far to the side, rather than take the time to descend and reposition the ladder. They have car accidents because they were speeding, weaving among traffic or ­tailgating. What to do: Build extra time into your schedule so that you don’t have to rush. Consider how little time rushing really saves. Driving 75 miles per hour (mph) rather than 65 mph on a 20-mile commute saves a mere 2.5 minutes. Rushing is rarely worth the risk. • Hearing loss. Hearing problems significantly increase accident risk, according to a 2018 study published in JAMA Otolaryngology—Head & Neck Surgery. We use our ears to identify nearby potential dangers much more than we tend to realize. This risk is worst for people experiencing the onset of hearing loss—­because they have not yet adjusted their behavior to compensate. Hearing aids could ­reduce accident frequency. Similar: Loss of other senses, such as declining vision, could increase accident frequency. • Aging. People tend to become slightly more accident-prone as they grow older because age can bring balance problems, muscle weakness and/or memory loss. • Multiple sclerosis. Falls and drops often are among the early symptoms of MS.
Are You Worried? Or Do You Just Care?